A. Batsmen must not be unfairly impeded when going for a run. NOTE - this doesn't mean they can't be impeded ... it just means they can'ty be unfairly impeded. And the definition of "unfairly"? Well, the AICF's rules don't really say, but it basically means "deliberately". So, if in the umpire's opinion a batsman is the target of unfair play by way of being impeded by a fielder, the batsman is not to be given out and all runs will count. The fielding team will be issued a warning. A penalty will be issued to the fielding team for a second occurrence, usually 5 runs. The AICF rules then state that a player may not be guilty of obstruction if they do not move. A rather inadequate statement, but I know what it's supposed to mean. If a batsman runs into a stationary fielder and, as a result of that collision, is run out, the fielder is not guilty of obstruction or interference is that fielder simply stood his ground. However .... the umpire's discretion comes into play when determining at what point the fielder became stationary, and what he was doing in that position in the first place. Much as in Basketball, a player isn't protected by the rules just by jumping in front of an opponent and thereby forcing the opponent to crash into them. However, unlike Basketball, the definition of this aspect of this rule is inadequate. If an umpire feels a fielder has taken up a position (other than the position they held as the batsman played the ball) simply to get in the way of one of the batsmen, regardless of how early in the play the fielder took up that position, the umpire would have good cause to consider Interference had taken place. If a runout resulted, involving the batsman interfered with, the umpire should call not out and give the fielder a warning (as above). B. The fielder has right of way provided they are legitimately fielding the ball - but may not deliberately collide with either batsmen. The converse of this rule is that the batsman is not protected by the rules just because he/she runs in a dead-straight line - deliberate contact must still be avoided. C. If the ball is bowled, but fielded prior to the batsman having the opportunity to hit the ball, the fielding team will be penalised 5 runs. This is classed as "unfair play", and the ball will be re-bowled. The AICF's rules state if the ball is fielded "deliberately". This is a tad confusing to new umpires especially. The simple fact is "if the ball is fielded". Fielded means a deliberate act to stop and/or take control of the ball - if the ball just hits a fielder, and the fielder wasn't trying to stop or take control of the ball, the ball wasn't fielded. A. Any behaviour deemed to be, in the opinion of the umpire, misconduct may incur a run penalty (see B below). The umpire does not have to give a warning of any sort before invoking the penalty. Any misconduct may result in the player(s) being sent off the court by the umpire. [See Rule 20]. B. In the absence of any specific Centre Rules, the maximum penalty for any single rule violation is 5 runs. However, in the case of misconduct related violations, the penalties can range in multiples of 5 to a maximum of 20, depending on the severity of the violation. C. Umpires must of course use their discretion when determining if run penalties are warranted for misconduct. Players may be warned prior to being penalised, but this is not a pre-requisite and depends on the nature and severity of the misconduct. It also depends on the competition underway - at National Championships almost all of the points below would be penalised without warning, whereas in a mid-week competition at the local centre, many of the lesser ones would attract a warning from most sensible umpires. ii. Swearing or making obscene gestures - some centres or competitions totally ban audible swearing. vii. Mistreatment of equipment (eg. bats, nets, carpets, stumps or balls). ix. Any player deliberately stepping on the nets. x. Disputing or arguing with the umpire. Note: The captain of the fielding side or the batter at the wicket may query an umpire's decision. Once the umpire has replied, any further talking to, at or about the umpire, or their decision, may be penalised. NOTE: if a wicket fell as a direct result of any of the above actions, the batsman should be given Not Out and at least a warning delivered to the offending player, no matter how "minor" the offence may seem. E. Any person or team found substituting or deliberately removing the shine, gouging or attempting to reshape the ball will be penalised 10 runs for ball tampering. For this reason, at National Championships in Australia, the ball must not be held by any fielder when the team meets for a "huddle". The ball must be left on the ground, in full view of the umpire. F. Unfair Play can be defined as actions taken outside the spirit of the rules of the game to create an unfair advantage over an opponent. The AICF's rules state that any of the following would be considered unfair play. However, the first one is a moot point, and although I have often seen fielders try this ruse (including back-stumpres in collusion with another player), I have never seen an umpire warn or penalise a fielder for doing so. The exception to this is if the bowler begins his run-up while the back-stumper actually has the ball hidden in his hands. This practise, refered to as a "Stooge", was specifically banned in Australia in the 1980's. The rules re: bowling reflect this. i. 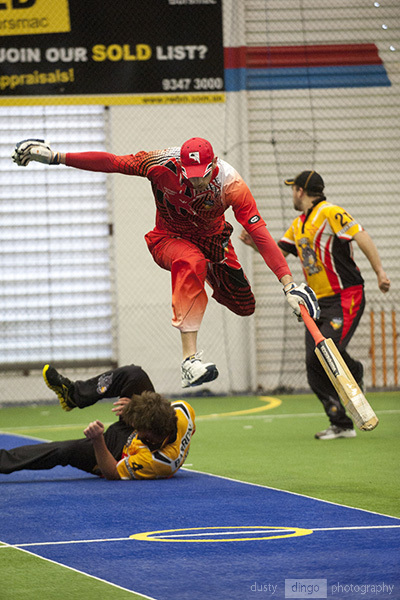 A fielder pretending to have the ball in order for the wicket keeper to run out a batter who may stray outside their crease (see note/comment above). ii. The AICF rules ban a wicket keeper "clicking their fingers to simulate a ball striking the edge of a bat". Does this mean the 'keeper can click his tongue for the same purpose? Of course not ... the rule should ban the 'keeper (or any fielder for that matter) deliberately making any noise (with any part of their anatomy) to give the impression the ball hit the edge of the bat. iii. Undue noise and movement during a bowler's delivery. I consider any noise from fielders, especially talking, from the moment the ball has left the bowler's hand until after the batsman has played at it, to be unfair. I'd call no-ball if I thought the batsman could hear that noise. iv. Unnecessarily slowing down play. A hard one to call .... a warning from the umpire is usually all that is required. v. After missing a delivery, the batsman lifting the bat in front of the wicket keeper to prevent the ball being thrown to the receiver. 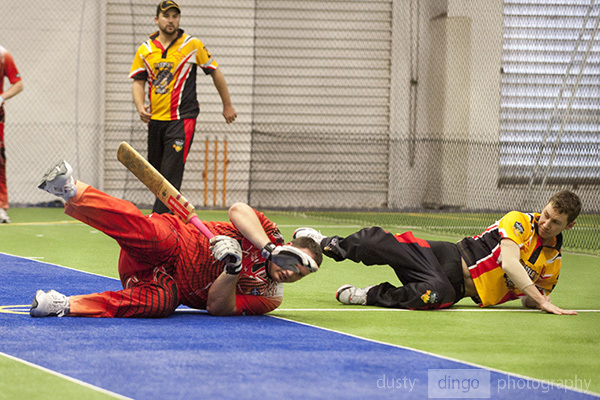 This is a practise many batsmen will try to get away with. Unfortunately, it is also a common thing for a good batsman to do when he has stepped across to a ball well outside off-stump, then decided to not play a shot. Raising the bat above shoulder height, to avoid any chance of getting an edge, is acceptable. Just watch the angle of the bat, and the position of the batsman when he does it. If the bat is held vertically, well above the shoulder, and the batsman remains in the position he attained by stepping out to the delivery, then this rule has probably not been breached. However, if the bat is held horizontally or at an angle noticeably less than vertical, and/or if the batsman takes another step beyond the one he took to the pitch of the delivery, then this rule has probably been broken. Not always as easy a rule to adjudicate on as it may at first appear. vi. Ball tampering - as in E above. G. A game may be stopped and awarded to one side, or cancelled, should infringements of the above nature escalate to the point where the captains have lost control of their players. It is a good idea to establish with centre-management or tournament management their expectations of an umpire if such a situation ever arises. Most managers would not be too happy with a game being cancelled (they would probably miss out on game fees) and might require their intervention if a game became out of control. H. Any player incurring 2 misconduct penalties for any reason should be ordered off for the rest of the game by the umpire. Again, individual centres may have different standards to this, so check with your centre's management.